It’s amazing how much misinformation can be held in one human head. 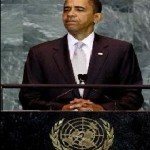 Yesterday Barack Husssein Obama told the assembled United Nations brain trust that the United States was committed to fulfilling our obligation to the world in doing more and more to stop the dread specter of climate change. He said, “We understand the gravity of the climate threat. We are determined to act. And we will meet our responsibility to future generations,” He might have added that “they may be eating gruel, but the climate will not change,” but he didn’t. Had he done so… it would have added a ring of truth to his talk.